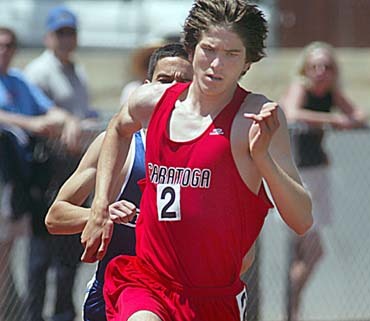 Saratoga junior Ken Douglas ran 4:27.56 in the 1,600 meters to finish 12th at the CCS semifinals and qualify for a berth in the CCS track and field finals. The meet is May 27 at Los Gatos High School. Alicia Follmar competes in a number of different events during the dual meet season for the Saratoga track and field team--the 800-meter run, the 1,600, the 3,200 and the high jump. That's generally pretty bad news for the rest of the Santa Clara Valley Athletic League. But when she gets to the big meets--the league finals, the Central Coast Section events--she starts to specialize. And that's even worse news for those who have to run against her. It was more of the same at the CCS semifinals held last Saturday at San José City College. Follmar concentrated her talents in the 800 and 1,600, and that was enough to help her win one event and qualify in both for the upcoming CCS finals coming up May 27 on the Los Gatos track. Follmar figures to be a top contender in each of the events at the CCS meet that's been moved to Los Gatos because of a scheduling conflict at San José City. Field events begin at 4 p.m. on Friday with the running events starting at 6 p.m.
Follmar cruised to a win in the 1,600 meters at the semifinals, stopping the watch at 5:02.55 to finish nearly a second and a half ahead of runner-up Amanda Boyd of San Benito, second in 5:03.99. The talented Saratoga senior was also third in the 800, running 2:16.71 to finish a few seconds off the pace set by Christine Jones of Live Oak (2:13.32). Follmar had earned her spots in the CCS semifinals with a couple of victories at the SCVAL finals held a week earlier at Los Gatos. Follmar is a two-time state champion in the 1,600 and she looked like it at the league meet when she ran away from Gunn's Tori Tyler and the rest of the field to nail the win. Tyler, one of the top distance runners around, won the 3,200 at the CCS semifinals in 10:42.75. "In a race that included what could be a three-time state champion [Follmar has run 4:49 twice and has won the state twice] in the event and most likely the state champion in the 3,200 this year [Tyler has the best time in the state thus far in the 3,200], we knew the pace would go out well from the start," said Los Gatos coach Monica Townsend. "Follmar took off with Tyler in tow," she added. "The rest of the race spread out at a more moderate pace." Follmar was also impressive in the 800 the same night. "With Follmar running in this event, we knew the pace would be at least decent," said Townsend. "Fourteen athletes with very similar qualifying times running in close proximity over the first 400 of this race was bound to create some serious jostling," she added. "Runners used up a lot of energy just trying to keep from being elbowed, tripped or boxed in the first lap." Everyone, that is, except for Follmar, who was well out in front by the final 200. Follmar is the only Saratoga girl in the CCS finals, but she won't be the only Falcon competing. Senior Danny Wallace, junior Ken Douglas and the 4x400 relay team have all qualified in boys competition. Wallace topped the high jump bar at 6-4 to get fourth place at the semifinals and Douglas ran 4:27.56 to nail 12th in the 1,600 meters. The 4x400 relay team from Saratoga was eighth in 4:04.23, good enough for a trip to the CCS finals. Lynbrook will send three athletes and a relay team to the section championship meet. Senior Yvan Pham raced to a third in the 300-meter hurdles in 39.35, senior Justin Teng was fifth in the 400 in 49.40 and sophomore MayC Huang was ninth in the 1,600 in 5:08.54. Lynbrook's boys 4x100 relay team was sixth in 43.00.